Get a bunch of your friends together. Eat some food. Poop out a new buddy. Then, blow them all up in a giant explosion. Yep, sounds like a Keita Takahashi game. Explosions usually bring joy by destroying things. 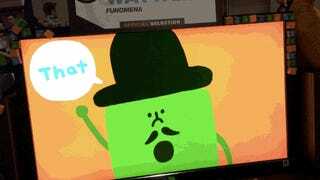 Wattam—the next trippy-cute thing from the man who created Katamari Damacy—has explosions that make people happy by making things. In true Takahashi fashion, it’s a physics-centric game that has players collecting a bunch of wacky personas after the Earth explodes, so you can explode them again. In a good way. The good kind of explosions happen via The Mayor, a lonely character whose detonations spawn new chunks of the obliterated planet back to the game world. You’ll have to do things like mow grass or shake trees to reveal the new characters—flowers that can stretch or walking, talking apples— that come into the game with each explosion. Players can switch to controlling any of the oddly-shaped folks that pop up into the world, making it so that anyone can use the Mayor’s explosive ability. 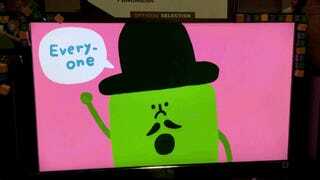 As Wattam goes on, more characters will need to be joined together to create the explosions. You can see Ryan Mohler from dev studio Funomena showing off an early build of the game in the video above. Getting the funkily-imagined creatures together feels a little bit like herding cats but they’ve all got weird abilities—like the egg sushi that has a jetpack— that makes the experience more fun. Funomena is trying to find the right balance for Wattam, aiming for a sweet spot between Takashi’s best-known design efforts. “Katamari [Damacy] was too much pressure for some people and Noby [Noby Boy] wasn’t enough,” Funomena CEO/executive producer Robin Hunicke. Hunicke—who was part of the team that made Journey—said that the game’s idea came from Takahashi’s play sessions with his the two-year-old son. The two were playing blocks and, in a fit of boredom, Takahashi mixed things up by imagining a world where every play object could come alive. The plan for Wattam is to have themed sections corresponding to each of the four seasons. It’s not due for a while but will be hitting the PS4 when it’s ready.